For the die-hard anglers out there your Tahoe vacation won’t be complete until you’ve embarked on a journey to catch the tastiest fish from the depths of crystal clear Lake Tahoe. The lake is practically teeming with mackinaw, rainbow trout, brown trout and kokanee salmon, all you need to catch them is the help of an expert fishing guide who will lead you to the fishing hot spots on the lake. There are many fantastic South Lake Tahoe fishing charters to choose from. 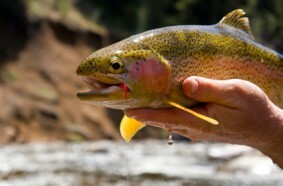 Trust Mile High Fishing Charters to lead you on a fishing adventure that you will never forget. The folks at Tahoe Fly Fishing Outfitters offer a diverse fishing shop, plus guide services for adventures in fly fishing, spin fishing, and charters on Lake Tahoe and other nearby lakes, rivers and streams. Expect a great day on the water with Tahoe Sport Fishing. It has the largest fleet of fishing boats on Lake Tahoe with knowledgeable captains who know the lakes hottest fishing spots. H2O Sports is another great option and is located at the popular Round Hill Pines Beach and Marina. There are year-round Lake Tahoe fishing charters at your disposal providing all the equipment you need for a great day of fishing fun and excitement. You never know what kind of whoppers may be hiding in the depths of one of the clearest lakes in the world, so let professional Lake Tahoe fishing guides give you that fighting chance. You haven’t experienced fishing, until you’ve experienced fishing Lake Tahoe style!